Mitsubishi Photo Imaging is a leading manufacturer of high-speed digital photo printers designed for professional and commercial use in event photography and or integration into photo booths or photo printing applications. 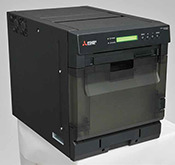 Mitsubishi photo printers are known for their durability and reliability, used by large photo retailers for kiosks, commercial photo booths and attraction photography. Imaging Spectrum has partnered with Mitsubishi since 2002 and has provided hundreds of large and small scale photo solutions based on Mitsubishi’s outstanding roll fed dye-sub technologies. Here are a few examples of how Imaging Spectrum customers have used Mitsubishi photo printers successfully in their photo businesses.